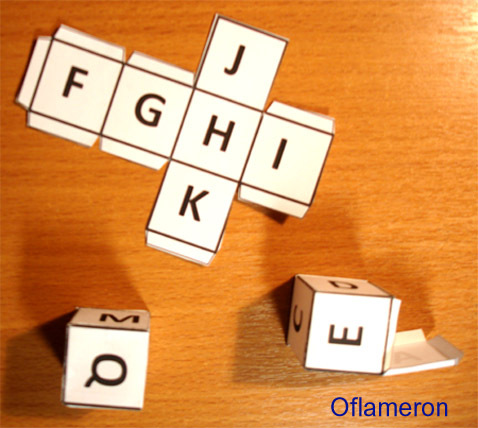 Special gaming dice OFLAMERON (3D flashcards) shall help you remembering French words effectively. Letters of the French alphabet are placed on die sides. 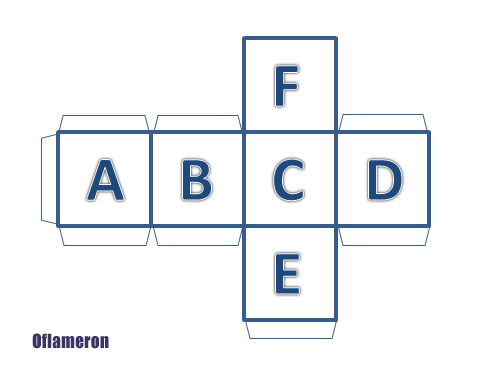 All alphabet can be placed on 5 dice. Gaming dice may be made by 2 methods: print out drawings, cut out and glue dice or place letters on sides of usual gaming dice. Either one or a few pupils may participate in the game. Players throw in turn all 5 gaming dice at once and write down the dropped-out letters on their sheets of paper. 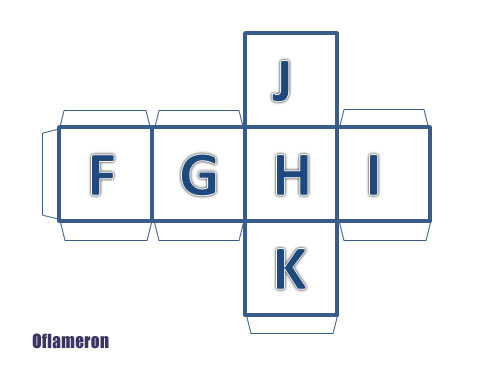 After several throws, it becomes possible to make French words of the written-down letters. Points are scored to the player for each made French word and its correct translation. The number of points is equal to the number of letters in the announced French word. 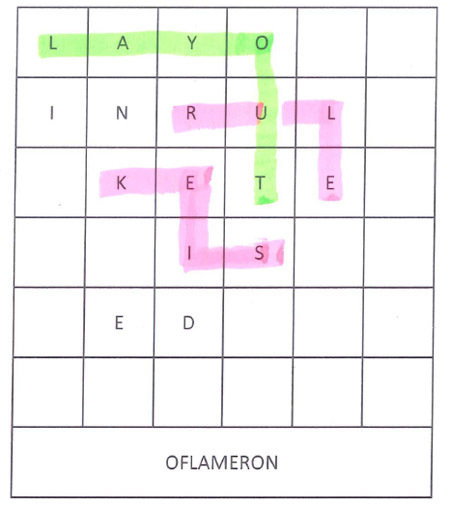 The letters used for drawing up the word are struck off the player’s list. 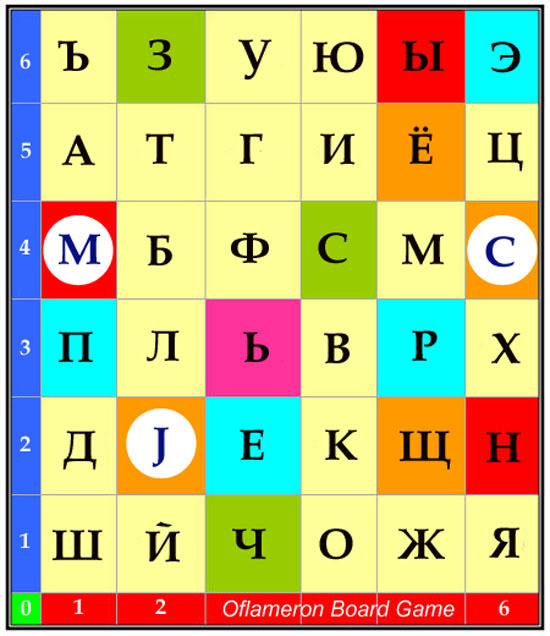 The player can announce only one French word per move. Before the game begins there should be defined the number of moves to be done by players. For example, each player will throw dice 50 times. 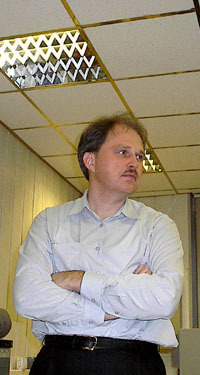 After that the game comes to an end, the gained points are counted and the winner is defined. While playing, the participants have to recollect constantly the French words, trying to make them of the letters collected. It makes players to repeat all French words known to them TENS OF TIMES within one game, thus ensuring a highly effective training. Such variant of game takes a rather long time. There is a faster variant of the game. The player announces the French words beginning with letters which dropped out on the dice. 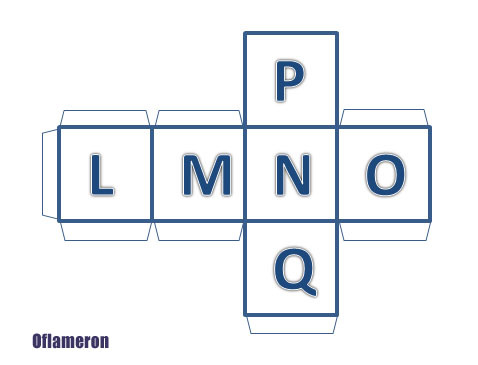 The player is scored points equal to the quantity of letters in those French words which he announced and to which he or she gave a correct translation. Game can be ended using one of two methods. The first one entails limiting the quantity of moves. 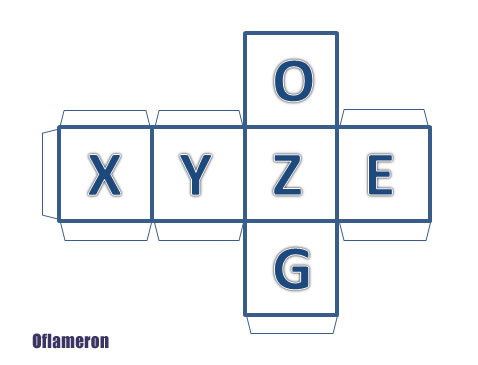 The second one is used when the player can’t announce any French word for the letters which dropped out on the dice. 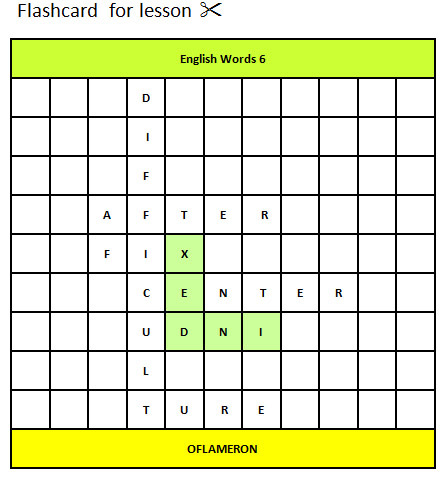 The playing field (flashcard) is a 6x6 standard Word-generated table. The table can be edited to learn any language. To start the game, you need two dies (here we use red and blue dies). The number of scores shown by the blue die is a vertical coordinate of the cell. The number of scores shown by the red die is a horizontal coordinate of the cell in the playing field "Oflameron". The students (players) are given the word which translation into the language they have to spell. To make it, the players alternate in throwing dies and write the words from the playing field cells. The person who will spell the word first wins. The game is for the children of 5 or 6 years old. 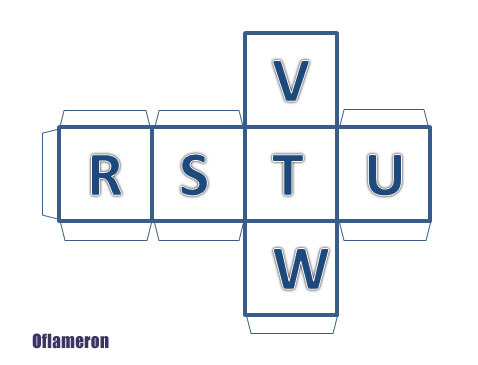 The children over 6 years can spell several words at once or a phrase or a short sentence. To make the game (lesson) more interesting, some cells can be replaced with prize pictures such as a sweet, a coin, a Joker. A Joker is a prize that can be chosen before the game starts. For example, two Jokers can be exchanged for one music CD, book, movie ticket. 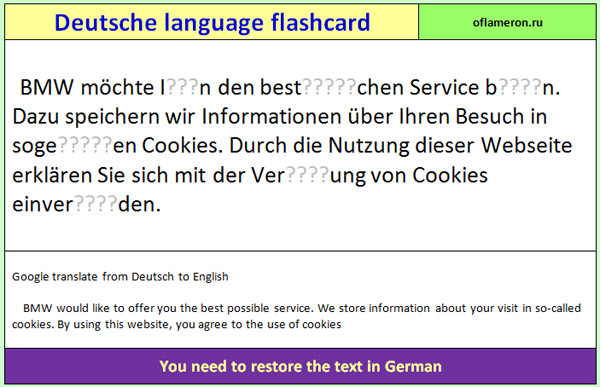 A simple table (flash card)can be used to memorize foreign words with children. The table has an unlimited length. The greater the length of the table, the harder the game. In the table VERTICALLY to record foreign words. 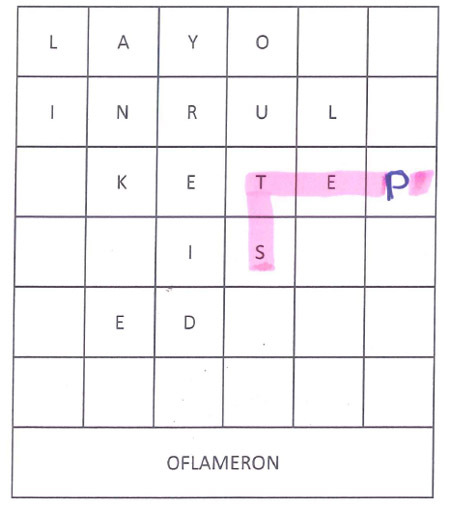 In this example, the French word. 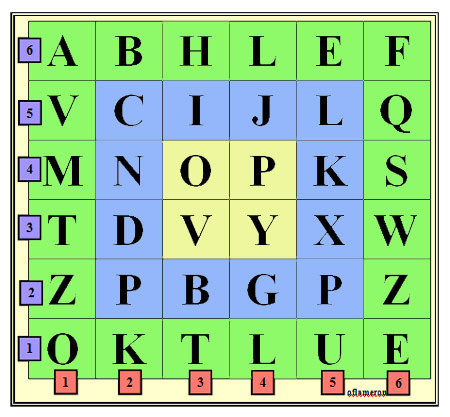 Each letter in a separate cell. Highlighted individual words. You can remove the color. Then play will be more difficult. You have to cut the table into rows. Get a set of tapes with the letters. The student must lay out the tape correctly to get the source table. The larger the table (flash card) the more difficult classes. 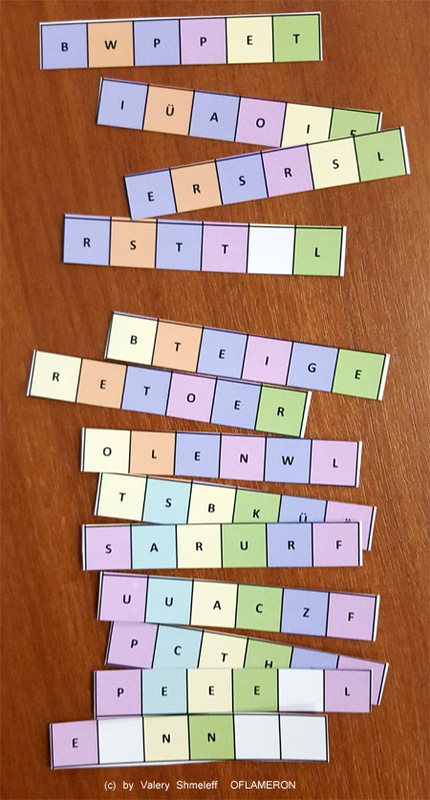 The task can be made even more difficult if you add the "extra" (unnecessary) ribbon with letters.